Aside from family, food, presents, and...more food, getting your game on is one of the best perks of the downtime that comes with the holidays. Whether you're sniping enemies in the line of fire, scoring the game-winning basket, or using superpowers to defeat mortal enemies, Sony's PlayStation is the ultimate vehicle to drive you to your gaming destination. Actually, there is one holiday perk even better than getting your game on...getting your game on and saving big bucks in the process! And with the PlayStation Store's Holiday Sale, you can save up to 50% on select games, or up to 75% if you're a PlayStation Plus member. From now through the end of December, select PS3 and PS Vita games will be on sale. And we’re not talking average discounts — this is a mega sale. Every week, you'll find a new crop of hit games available for absurdly low prices in the PlayStation Store. You can even score some popular movies and TV episodes for just 99 cents! If there's one thing gamers can never get enough of, it's games — and this is your chance to stock up. 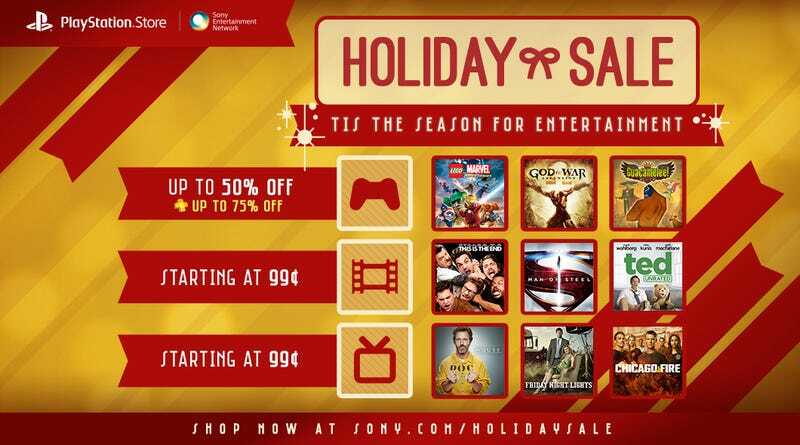 With the PlayStation Store's Holiday Sale, you can enjoy gaming abundance without breaking the bank. Just be sure to make the most of this sale before the New Year, or your first resolution will be to pay better attention to deadlines! Head here to shop the PlayStation Store's Holiday Sale Now!